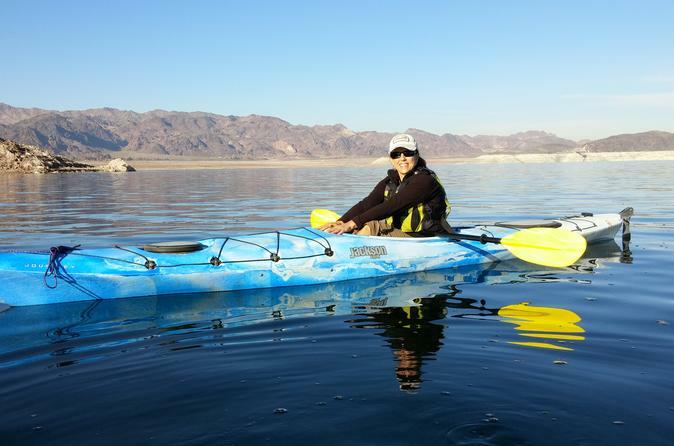 Lake Mead is the 16th largest man made lake in the world and is the setting for this amazing paddling adventure. This is the perfect kayak trip for all skill levels, (including those with no experience). This relaxing journey is a must! After your pick up from your hotel on the Las Vegas Strip, you will travel to our shop in Historic Boulder City to check-in and buy any last minute needed items. From there,you will travel down to a beach at Lake Mead where your trip will begin. A professional guide will be with you to offer instruction, stories, local history and information about the construction of the Hoover Dam. You will paddle out to the Boulder Islands to enjoy a leisurely hike or a refreshing swim. To top off a great day being on the water, enjoy a picnic style lunch. This trip is a beautiful peaceful lake experience. Come relax in the waters of Lake Mead!